Petainers are completely new kind of beverage packaging. 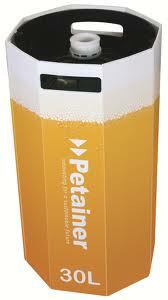 They revolutionary solution in the brewing industry, like PET bottles are replacing traditional beer in the glass. PETAINER is disposable plastic container in the shape of a barrel with a volume of 15, 20 or 30 liters. Low weight – a full 20-liter barrel Petainer weighs less than 21 kg and can be easily manipulated with him. 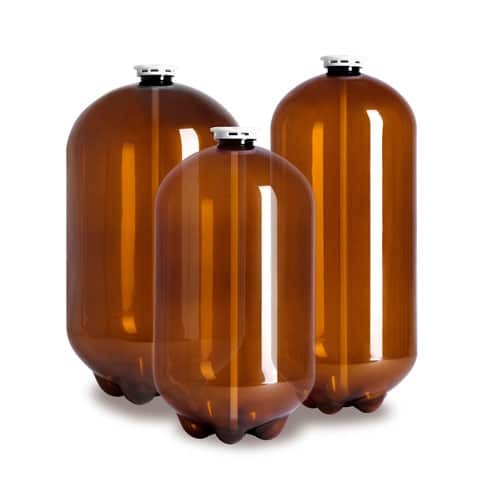 Customers save money on advances in metal kegs and therefore have zero cost to return and clean. Emptied Petainer be safe after depressurization slightly flattened and easily disposed of in the same manner as any other PET packaging. Reduction of required storage space, reduce transport costs by 20-30%. Petainer Barrels are brown colored plastic and are usually distributed in a specially designed cardboard packaging, which also provides protection against UV radiation, and easy manipulated. Emptied Petainer are safe after depressurization and can be slightly flattened and easily disposed of in the same manner as any other PET packaging. These advantages are the benefits in terms of ecology and friendliness to the environment. The PKF-50 is an equipment for automatic-operated filling of plastic kegs for beer, cider, wine or other beverages. 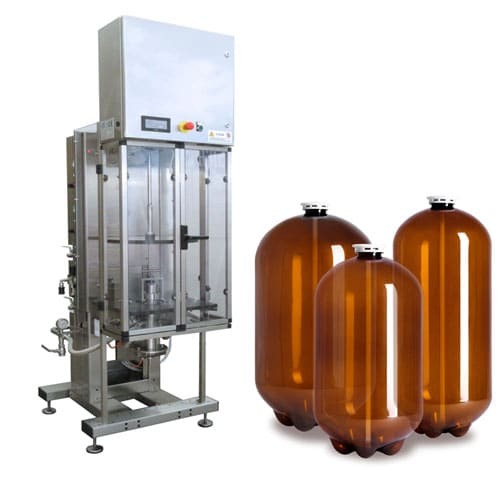 Operating capacity : from 45 to 55 kegs per hour (Polikeg®, Ecokeg®, Petainer®, Key-Keg®, Key Keg® Slim Line). The Morekegs Compact S is a one-piece version filler. Conceived for the filling of kegs that are different from stainless steel (keg) ones for beer, still wine, sparkling wine, beverages etc. It is made in the version for: Polikeg®, Ecokeg®, Petainer®, Key-Keg®, and Key Keg® Slim Line. Using the same machine, via the simple keying in on the operator panel, you can fill various types of plastic kegs taking care to assemble each time the specific kit for the type of keg that is to be used. 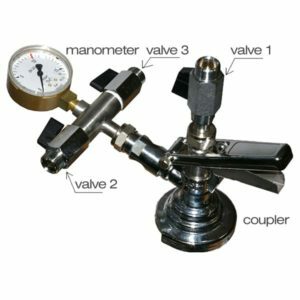 The kit is made up of a centering device (ferrule) and a head that adjusts to the type of keg system.The entire structure of the machine and the parts that are in contact with the filling liquid are made out of AISI 304 and 316 stainless steel. The work phases are managed automatically. The only manual step is the loading and unloading of the keg at the processing point. The only difference is that Petainer before filling does not need to be washed and sanitized. Microbrewery that uses Petainer kegs instead, saves money for the purchase of keg washers, wages of operators, sanitation solutions, heating hot water and consumption of drinking water. The owner does not have to worry about keeping lent kegs and costly storage and transport. For the customer, it is easy to use Petainer. 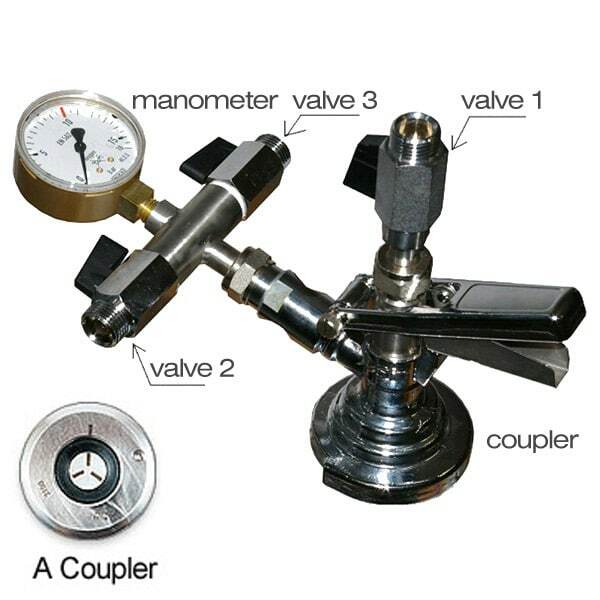 The customer connects the Petainer to the beer tap equipment as KEG and using known method they can serve beer.